South Carolina-grown peaches provide vitamins A and C, are a good source of fiber and are low in calories—35 calories per 2½" peach. There are many ways to preserve the goodness of peaches well past the harvest season. 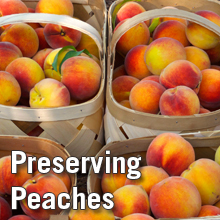 Examples include canning peaches, freezing them, making salsa or making preserves. For more recipes, see the sources at the end of this tip. Choose ripe, mature peaches of ideal quality for eating fresh or cooking. Peaches should be firm, or "give" slightly and should have a strong, sweet smell and a yellowish golden background color. To peel, dip peaches in boiling water for 30 to 60 seconds until skins loosen. Dip quickly in cold water and slip off skins. Cut in half, remove pits and slice, if desired. To prevent darkening, keep peeled peaches in ascorbic acid solution (1 teaspoon or 3000 milligrams ascorbic acid or vitamin C per gallon of water), or use a commercial ascorbic acid mixture according to directions on package. Drain when ready to process. Canning Peaches (Halved or Sliced) Yields: Approximately 2 to 2½ pounds peaches for a 1-quart jar. Prepare and boil syrup, using ½ cup (very light), 1 cup (light) or 1¾ cup (medium) sugar per quart of water, depending on desired sweetness. Or pack peaches in water, apple juice or white grape juice. Place drained fruit in a large saucepan with syrup, water or juice and bring to boil. Adjust lids and process in a boiling-water canner: 20 minutes for pints, 25 minutes for quarts at altitudes up to 1,000 feet. Adjust lids and process in a boiling water canner: 25 minutes for pints, 30 minutes for quarts at altitudes up to 1,000 feet. Dissolve ¼ teaspoon ascorbic acid in 3 tablespoons cold water and add to each quart of peaches to slow darkening. Add ⅔ cup sugar to each quart (1⅓ pounds) of prepared fruit. Stir gently until sugar is dissolved or let stand 15 minutes. Place into containers. Sterilize canning jars by boiling for 10 minutes. Combine 2 quarts crushed, peeled peaches and ½ cup water; cook gently for 10 minutes. Add 6 cups sugar; slowly bring to boiling, stirring occasionally until sugar dissolves. Cook rapidly until thick, about 15 minutes; stir frequently to prevent sticking. Pour hot jam into sterilized canning jars, leaving ¼–inch headspace. Wipe jar rims and adjust lids. Process jars in a boiling water bath canner for 5 minutes at altitudes up to 1,000 feet. Add 1 minute of processing time for each additional 1,000 feet. Make easy peach jam by buying your favorite pectin and following the manufacturer’s directions. Wash and rinse pint canning jars; keep hot until ready to use. Prepare lids. Place pickling spice on a clean, double-layered, 6-inch-square piece of 100% cheesecloth. Bring corners together and tie with a clean string. Wash and peel tomatoes (place washed tomatoes in boiling water for 1 minute, immediately place in cold water, and slip off skins). Chop into ½-inch pieces. Peel, wash and dice onions into ¼-inch pieces. Wash, core, and seed bell peppers; chop into ¼-inch pieces. Combine chopped tomatoes, onions and peppers in an 8- or 10- quart Dutch oven or saucepot. Wash, peel and pit peaches; cut into halves and soak for 10 minutes in an ascorbic acid solution (1500 mg in half gallon water). Wash, peel and core apples; cut into halves and soak for 10 minutes in ascorbic acid solution. Quickly chop peaches and apples into ½-inch cubes to prevent browning. Add chopped peaches and apples to the saucepot with the vegetables. Add the pickling spice bag to the saucepot; stir in the salt, red pepper flakes, brown sugar and vinegar. Bring to boiling, stirring gently to mix ingredients. Reduce heat and simmer 30 minutes, stirring occasionally. Remove spice bag from pan and discard. With a slotted spoon, fill salsa solids into hot, clean pint jars, leaving 1¼-inch headspace (about ¾ pound solids in each jar). Cover with cooking liquid, leaving ½-inch headspace. Remove air bubbles and adjust headspace if needed. Wipe rims of jars with a dampened, clean paper towel; apply two-piece metal canning lids. Process in a boiling water canner for 15 minutes at altitudes of up to 1000 feet, or for 20 minutes at 1,001 to 6000 feet. E.L. Andress and J.A. Harrison, Eds. 2006. So Easy To Preserve. Georgia Cooperative Extension/The University of Georgia.